There's a Surgeon General to oversee public health matters, and an Attorney General in charge of law enforcement. Why not a national guardian of grammar? A sentinel for spelling? A lookout for lapses in language? If I were in charge, this is how I'd do it. I see you're currently choosing your Cabinet. That's great. It's important to make the right decisions and bring in the right people. There's a lot of cleaning up to be done, and you're going to need help. May I present, for your consideration, the possibility of a new, nominated position under the Department of Education? I see this role as being responsible for maintaining standards of grammatical competence in all communications from commercial, non-profit and government organzations to the public: signage, posters, ads, websites — you name it. Heaven knows there are plenty of examples to justify the need. 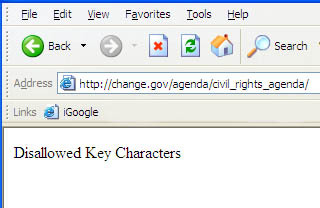 It's time for the Copyeditor General. I should warn you that this role should have a free hand to stamp out typos, punctuation errors and usability issues wherever they occur. And that goes right to the top, sir. 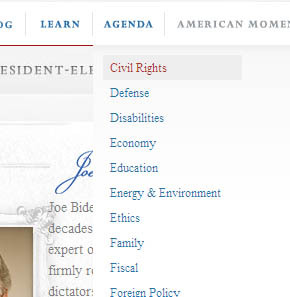 It's great that your people have created change.gov to keep us up to date with the transition toward January 20. But I need to draw your attention to a few areas. There's the serial comma issue, for instance. Are you for it or against it? Here's the best one, sadly too large to embed here in a readable size: a paragraph that gives it to you both ways. Thankfully, this last has now been fixed. But how long did it take? Copyeditor General's ruling: Drop me an email, sir. I'll be waiting. Oh, also, could you find a post for Melinda? She brought the serial comma issue to my attention, which means she's Deputy of the Week. Thanks. I haven't had much time do begin holiday shopping (or to do anything else for that matter), so this morning I tried to kick-start the process online. Unfortunately, I got derailed pretty quickly. 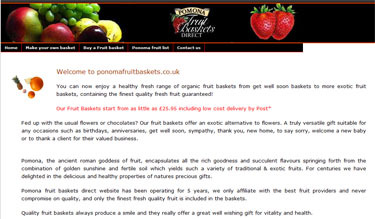 During a search for organic fruit-of-the-month clubs in the UK (of which there are none, it seems--there's a niche waiting to be filled), I came across the site for Pomona Fruit Baskets. It certainly looked inviting enough. 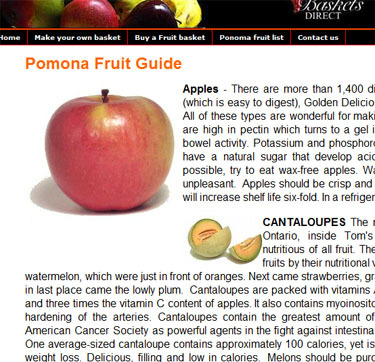 Copyeditor General's ruling: There's certainly nothing wrong with buying an off-the-shelf template for your company website, Pomona. 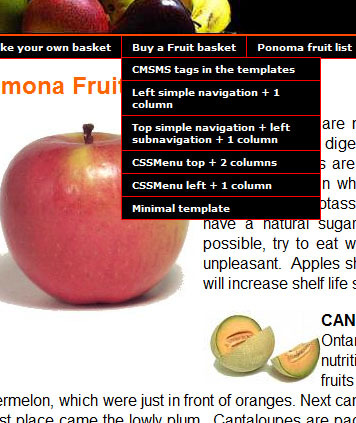 But you should pick over the code and harvest out the pages that detract from the site's overall quality and visual appeal. I mean, you wouldn't leave wrinkled grapes on a bunch, or keep moldy apples next to fresh ones, or pack over-ripe bananas underneath pineapples, would you? I'm staying at a golf resort in Orlando, one of those frighteningly new places that seem to have risen, fully stocked with fresh towels and $25 breakfasts, out of the Florida swamp. Everything is neat and clean and bright and climate-controlled; on a stroll through the grounds early this morning, I didn't encounter a single fellow-guest, but I did see a dozen different people whose job seemed to be preventing the grass from becoming disorderly. Copyeditor General's ruling: If your brand is centered around "superior service" and "four-diamond luxury accommodations," it's a good bet that your clientele knows its way around a wine list—or at least around an atlas. 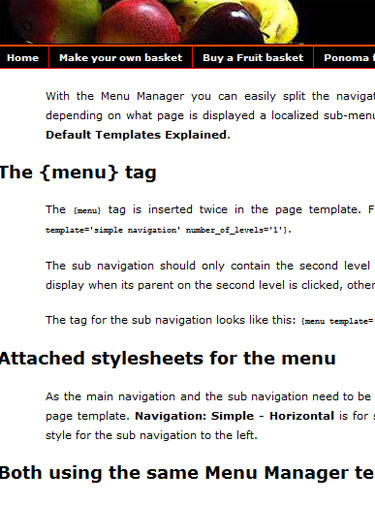 Typos like this make me wonder where else you're cutting corners. You've probably heard of Lewis Black, the angry truth-teller who rants about politics and culture. Aggressive, visceral, supremely confident in his opinions. Seems like a masculine individual, right? Oh, Lewis! Is your message what I think it is? Copyeditor General's ruling: Turns out that no, Lewis is not becoming Louise. The message is just a rant that "doctors" should hurry up and "cure cancer," because, as everyone knows, cancer is a single disease that can be fixed with one simple magic bullet. But that's an angry rant for another day.